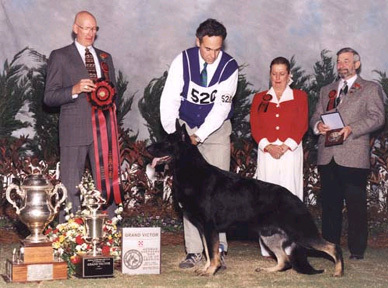 "We are again honored and humbled to have BOSS appear in the Red Book as the #2 Futurity/Maturity sire and rank #1 in the AKC system as the top producing German Shepherd Dog. We appreciate and thank the breeders who have used him and the exhibitors that fulfill the results of the breedings. They make it happen. His progeny are from a variety of lines but always recognizable coupling with strong powerful rear drive and correct precision movement along with intelligence and a strong working and play drive. He also is producing a high percentage of OFA progeny. We believe he will have a great impact on the breed himself and through his progeny and will do no harm. We again feel privileged to be able to share our Best Buddy with everyone and again we thank the friends, breeders and exhibitors who appreciate him almost as much as we do. he still looks great, feels great and rules supreme here along with his dam."